Shall I compare thee to a summer’s day? Maybe not, but I would spend many a sunny day inside watching this production again and again! OK, I’m going to admit this here and now, I’m not really a fan of period drama… Now I know that these days I’m verging on sacrilegious but I just felt like I had to get that off my chest. 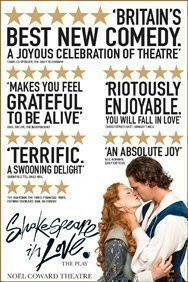 So when I was invited to see Shakespeare In Love, the hottest new period drama production at the Noel Coward Theatre, I was dubious. Luckily for me I had a flatmate who lives and breathes this genre and so was more than excited enough for the both of us! Adapted from Marc Norman and Tom Stoppard’s Oscar winning film of the same name, Shakespeare In Love paints a different image of the great playwright himself. In the middle of a creative rut, Will (as he is affectionately known) is stuck for ideas to complete his latest work. Despite some creative words of wisdom from close friend and fellow playwright Christopher Marlowe, without a muse to inspire him Will is under pressure from two quarreling theatre managers to deliver the goods quickly. Luckily, his latest work is viewed by Queen Elizabeth I and her entourage, including debutante Viola de Lesseps. Desperate to prove that a woman can be an actor, Viola disguises herself as a boy (Thomas Kent) and auditions for Will’s latest (still to be written) production. A natural talent, Will goes to her family house personally to offer her a leading role and finds not the boy Kent but the inspiring muse Viola herself. Romance and heartbreak lead Will to finally complete his most famous tragedy of all, Romeo and Juliet. Briggs-Owen and Bateman delivered the 2 most famous scenes of the play with maturity, professionalism and above all an incredible connection. On seeing the set as we walked in, I was struck by the simplicity of Nick Ormerod’s design, reminiscent of traditional Elizabethan style. The understated wooden architecture was easily transformed into the necessary locations for the play, from bedroom to balcony and from theatre stage to behind the scenes. I particularly enjoyed the latter transformation – the backdrop of the set moved silently upstage so that the audience could experience the atmosphere from both sides of the curtain. It reminded me of an equivalent moment in Jersey Boys and I liked it then as well! However, despite the simplistic set, there was great attention to detail in decorating the scene with a few well-chosen props – water sloshing in a bucket is a simple concept but is all that is needed to evoke the sounds of the Thames during a boat crossing. Of course, no set (however carefully crafted) can make a play, only the actors can do that. My favourite performance of the evening was Marlowe (David Oakes), the tag-along (more intelligent) friend that Will (Tom Bateman) depends upon when caught in sticky situations. Oakes played this character with a dry wit; it was easy to imagine the mixture of frustration and admiration that Marlowe would have felt for the main protagonist. I particularly enjoyed the Oakes’ range of facial expressions – the ‘I-told-you-so’ and ‘That was my idea!’ reactions to some of Will’s inadequacies had the audience laughing without fail. The other performance of note amongst these accomplished actors was the heroine Viola De Lesseps (Lucy Briggs-Owen). Briggs-Owen delivers a funny yet emotional performance, not easy to do with the number of quick changes she had to perfect. One minute she was running on stage as an upper class socialite and then in the next she appeared disguised as an aspiring male actor, moustache and all. The chemistry between Briggs-Owen and Will (Tom Bateman) was really electric, especially in the second half when the audience is treated to a few choice scenes of Romeo & Juliet in its première performance. Now I (and the majority of the audience I imagine) have seen Romeo & Juliet performed badly a lot, but Briggs-Owen and Bateman delivered the 2 most famous scenes of the play (the balcony scene and the death scene) with maturity, professionalism and above all an incredible connection. In that moment I completely forgot that I wasn’t watching the play itself, they slipped into character so easily. These scenes were Bateman’s saving grace in an otherwise slightly style over substance performance. Acting opposite Briggs-Owen was a tough standard to meet though and he did improve throughout the show. Of course no play is perfect and this one had some small flaws. My main issue was the live background music – a great idea from director Declan Donnellan with some really authentic Renaissance pieces by Paddy Cunneen, it just didn’t hit the mark. The live instrumentalists on stage were either too loud at the wrong moment, or the voices and instruments were flat, which was really off-putting to anyone with a musical ear. Despite my less than enthusiastic view of the genre, I was completely won over by this play. So, the ultimate question, was I converted a period drama fanatic? My flatmate will be dismayed to know that I was not, despite her best efforts. But I will say that despite my less than enthusiastic view of the genre, I was completely won over by this play. If nothing else, all period drama should have a dog as hilarious as Spot (Barney) was – “Out damn Spot!” was definitely one of my favourite tongue-in-cheek lines! There’s good news and bad news about this National Theatre production of an ancient Greek drama, starring Helen McCrory. The good news is McCrory herself who gives a gripping performance as an exiled queen driven to murder; the bad news is the adaptation by Ben Power, who makes some odd choices which in my opinion weakens this critically acclaimed revival.